This is a very popular window that has two sashes that are both operable (side-to-side).Includes a screen that covers the full glass area. Both sashes can tilt inside the house for easy cleaning .It is ideal for rooms that have large windows and require greater ventilation without compromising view. 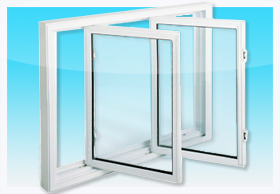 Double slider tilt comes with 3 1/4" welded frame and sash, 7/8" thermal warm edge sealed unit, triple weather-stripped sashes, recessed locking latches for improved appearance, central interlocking system that provides good security as well as air tightness, Insta Lock shoes for added security and heavy-duty balances.